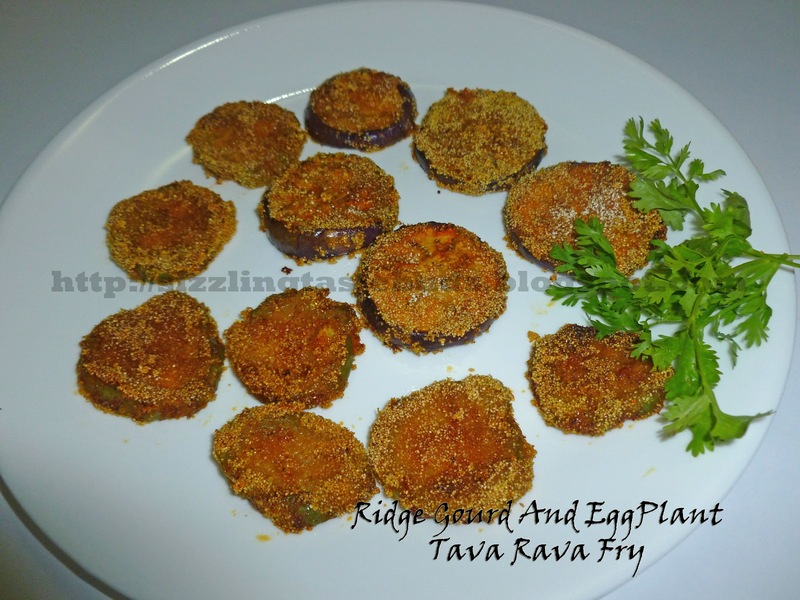 Ridge Gourd ( HeereKai in Kannada) and Eggplant (badanekai) is one of the simple, quick and tasty vegetable fry ever. I have already posted Bread Fruit and Fish fry with the same masala. One of my mom's konkani friend used to prepare this Eggplant fry. She indeed had a huge collection of vegetable fries and pakora's. Hmmm..yummy. It had been years I didn't taste this eggplant fry. Checked my refrigerator and found only two small Eggplants. Oh! I used the rest for Sambar. Still went along with the idea and included Ridge Gourd too for the yummy fries. You can include even potatoes if you don't like Eggplants. Oil - for shallow frying. Chiroti rava/ semolina for coating. 1. Wash the vegetables and cut it into slices. Remove the sharp ends of the ridge gourd and cut into slices. 2. Make a paste of red chilli powder, haldi, amchur powder and Salt with little water. 3. Apply this to the vegetable slices and keep aside for 10 mins for marination. 4. Coat each slices with rava and place it on the greased frying pan or tava. Cover it with a lid and cook for 3-4 mins in a low - medium flame. 5. Turn the slices and cook till the vegetables are cooked.